The Mary Webb Society is delighted to be involved with the screening of Gone to Earth by Flatpack as part of Telford Film Festival. The event is hosted by The Gorge Film Club, at Coalbrookdale & Ironbridge Community Centre, 2 Wellington Road, Coalbrookdale, Telford TF8 7DX Shropshire. The film adaptation of Mary Webb’s novel published in 1917 is well known in Shropshire as the time when Hollywood came to the county. 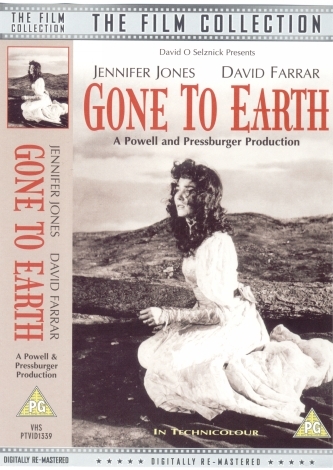 In 1949, major stars such as Jennifer Jones and David Farrer, together with a film crew and entourage descended on rural communities to bring Mary Webb’s story to life. The beautiful landscape of Shropshire provided the perfect backdrop to the story of Hazel Woodus, a simple country girl who is pursued by both squire and minister. Locals were recruited as extras, and memories of the exciting days of the filming are still fondly remembered by families today. This magical piece of classic cinema has always had a special place in Shropshire hearts. Dont miss it. There will be a Society display and books and CDs for sale.